Manufacturer: Chevrolet Division of General Motors LLC, Detroit – U.S.A.
– Chevrolet was co-founded by Louis Chevrolet and William C. Durant. Louis Chevrolet was a race-car driver, born on December 25, 1878, in La Chaux de Fonds, Switzerland. William Durant, founder of General Motors, had been forced out of GM in 1910 and wanted to use Louis Chevrolet’s designs to rebuild his own reputation as a force in the automobile industry. As head of Buick Motor Company, prior to founding GM, Durant had hired Chevrolet to drive Buicks in promotional races. – By 1916 Chevrolet was profitable enough to allow Durant to buy a majority of shares in GM. After the deal was completed in 1917, Durant was president of General Motors and Chevrolet was merged into GM, becoming a separate division. – The name “Camaro” was conceived by Chevrolet merchandising manager Bob Lund and General Motors vice president Ed Rollett, while they were reading the book Heath’s French and English Dictionary by James Boïelle and by de V. Payen-Payne printed in 1936. It states that Mr. Lund and Mr. Rollett found the word “camaro” in the French-English dictionary was slang, to mean friend, pal, or comrade. – In fact, the actual French word that has that meaning is "camarade", from which the English word "comrade" is derived and not "camaro"; "camaro" is not a recognized word in the French language. – The Camaro (code-named Panther) was first shown at a press preview in Detroit, Michigan, on September 12, 1966. – This first generation Camaro’s (1966-1969) went on sale on September 29, 1966, for the 1967 model year and was designed as a competing model to the Ford Mustang. 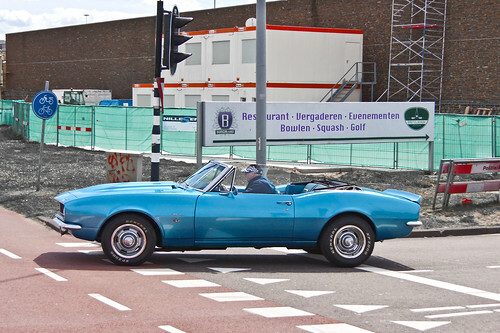 – It shared its platform and major components with the Pontiac Firebird, also introduced for 1967. – The 1967 Chevrolet Camaro V8 Series 12400 (L30) was available as this 2-door Convertible and as 2-door 12437 Sport Coupé (160,648 units built).